Heat sufficient oil in a non stick wok. Place refined flour in a bowl. 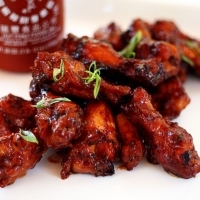 Add chicken wings, red chilli sauce, salt, pepper powder, 2 tbsps oil and egg and mix. Add garlic paste and mix well. Add 2 tbsps water and mix. Deep fry the chicken in the hot oil till fully cooked and golden. Meanwhile heat 2 tbsps oil in a non stick pan. Add garlic cloves and sauté till well browned. Add red curry paste and tomato ketchup and mix well. Add fish sauce and mix. Drain the chicken and add to the above sauce and mix well till the sauce coats all the chicken wings. Roughly tear the lettuce and arrange on a serving dish. Deep fry snow peas in the hot oil for 10 seconds. Drain and add to the chicken. Transfer the chicken over the lettuce. Deep fry basil leaves for 10 seconds and drain on absorbent paper. Garnish chicken with these and serve hot.